Carol Cramer, of Bloomingburg, poses with Ohio Attorney General Mike DeWine following Monday’s Lincoln Day Dinner. 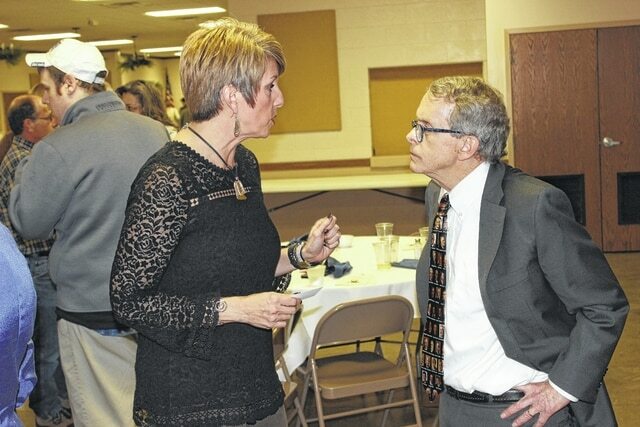 Ohio Attorney General Mike DeWine speaks with Leah Foster, a member of the Washington C.H. City Council, following Monday’s Lincoln Day Dinner. Ohio Attorney General Mike DeWine speaks in front of a crowd of over 200 at the 54th-annual Lincoln Day Dinner, held at the Mahan Building on Monday evening. In front of an audience of over 200 at the annual Lincoln Day Dinner, Ohio Attorney General Mike DeWine reflected Monday evening on some of his accomplishments and also laid out his vision for the future of the state. DeWine, the former Republican U.S. senator who’s serving his second term as state attorney general, plans to run for governor of Ohio in 2018. Republican Gov. John Kasich is prevented by term limit rules from running again. 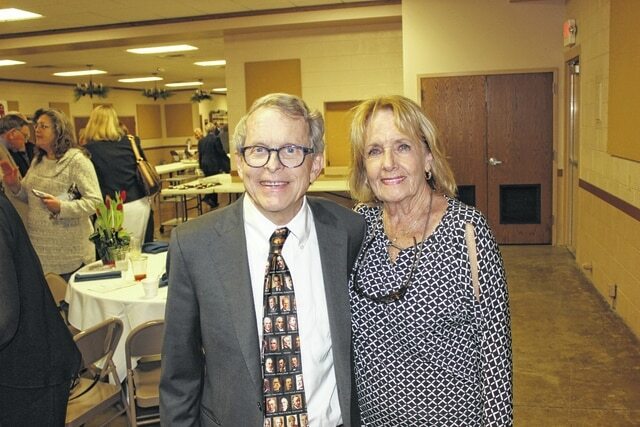 During the 54th edition of the Lincoln Day Dinner, held at the Mahan Building on the Fayette County Fairgrounds, members of the Fayette County Republican Party also listened to DeWine talk about many of his office’s accomplishments, including improving the crime lab and expediting the return of DNA evidence to prosecutors and law enforcement. “We’re doing six times the amount of work now than the day I took office,” DeWine said. DeWine added that a special children’s unit has been organized to protect children from sexual predators and others who commit crimes against children. Cracking down on elder abuse crimes has also been a high priority during DeWine’s tenure. DeWine also took the opportunity Monday to look toward the future. Taking care of the natural advantages that Ohio already has is a good start, DeWine said. DeWine said he believes a governor’s “number one job” is to create a business climate within the state that is conducive for businesses to come, and for businesses that are already here to expand. DeWine also spoke at length about education and the importance of teaching our children to make healthy choices at an early age. The opioid addiction epidemic has been a challenging issue for DeWine. DeWine left the crowd with a note of optimism. https://www.recordherald.com/wp-content/uploads/sites/27/2017/02/web1_IMG_3308.jpgCarol Cramer, of Bloomingburg, poses with Ohio Attorney General Mike DeWine following Monday’s Lincoln Day Dinner. https://www.recordherald.com/wp-content/uploads/sites/27/2017/02/web1_IMG_3306.jpgOhio Attorney General Mike DeWine speaks with Leah Foster, a member of the Washington C.H. City Council, following Monday’s Lincoln Day Dinner. 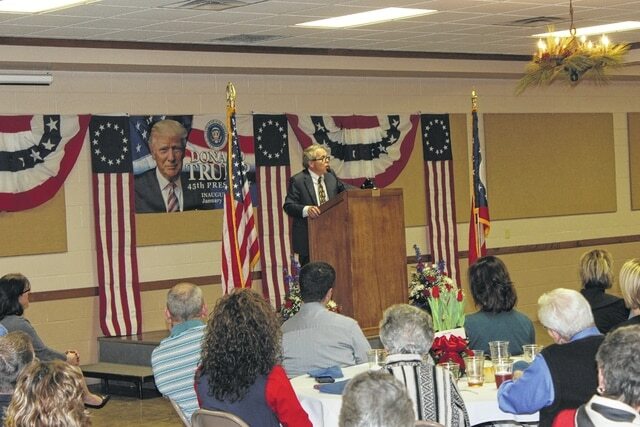 https://www.recordherald.com/wp-content/uploads/sites/27/2017/02/web1_IMG_3303.jpgOhio Attorney General Mike DeWine speaks in front of a crowd of over 200 at the 54th-annual Lincoln Day Dinner, held at the Mahan Building on Monday evening.